This is the 11th National Hurricane Conference (NHC) that I've attended in a row. I missed the 2003 and 2004 Conferences because of my involvement in the Iraq war. I enjoy the Conferences not only because of the information disseminated in the sessions and exhibits but because of the opportunity to network and meet new people in the mass care community. on Thursday, the final day of the Conference. On Monday I participated in a day long session on the Shelter Field Guide (follow the link to the National Mass Care Strategy website to obtain an electronic copy). This class wasn't on how to be a shelter manager but on how to best utilize the Guide to solve common problems presented during sheltering. We worked in groups to solve injects involving a church that decides to shelter survivors of a large local disaster. I learned a lot about not only sheltering but how useful the Guide could be. Al Vliet from FEMA (standing) was one of the instructors for the Shelter Field Guide Training. Tuesday, the second day of training offered at the conference, was meteorological day for me. Three of the four sessions I attended were taught by our friends at the National Hurricane Center and the National Weather Service. The highlight of the day was the session on Atlantic hurricane forecasting taught by noted Colorado State University forecaster Phil Klotzbach (see a copy of his presentation here). Phil gave us some hints on the upcoming hurricane season but is saving his final judgment for his soon to be released April 14th forecast. with me to noted hurricane forecaster Phil Klotzbach. The highlight for Wednesday was our "Voluntary Agency Rap Session." 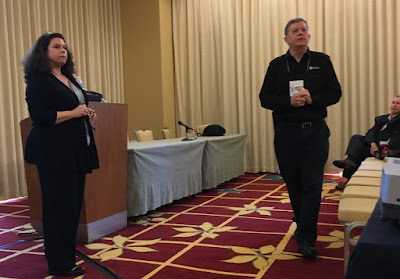 The session was well attended and the discussion was dominated by the obscure, but important, process for using the value of donated resources and volunteer hours to aid state and local jurisdictions during federally declared disasters. When the President declares an emergency under the Stafford Act the federal government helps defray select costs of the disaster (normally 75%). In some disasters the expenses are so great that some local communities are hard pressed to pay their share of the remaining 25%. 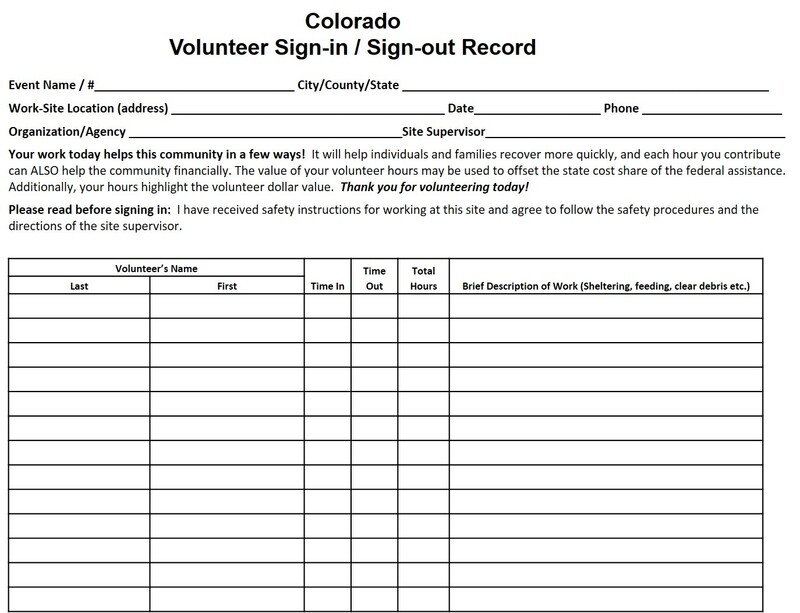 This is where the voluntary agencies can help these communities by documenting the donated resources and volunteer hours that they contribute to the response and recovery. In some disasters this contribution can mean a lot of money to the beleaguered local jurisdictions. But like everything else with the federal government when it comes to money this means documentation, documentation and more documentation. The discussion in the Rap Session was centered around how the voluntary agencies could meet this documentation requirement. 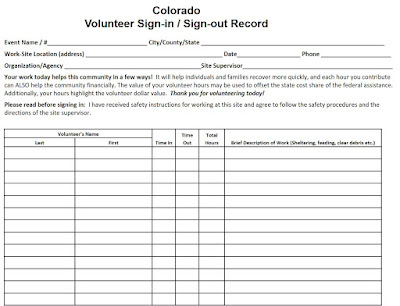 An example of a form developed in Colorado to document volunteer hours is shown below. FEMA, who must accept and validate whatever the voluntary agencies provide, does not want to be prescriptive about how the documentation is submitted. This is understandable but leaves the voluntary agencies guessing as to how they are going to meet this requirement. Everyone needs to come up with a process that FEMA will accept, but no one wants to take the time and effort during a disaster to gather detailed information that will be denied by some FEMA Reservist in a Joint Field Office 9 months later. Thursday, the final day of the National Hurricane Conference, offered multiple mass care workshops. My favorite, of course, was the one that I offered as a topic last December and was accepted: Shelter Transition. Shelter transition is the multi-agency process by which survivors in a congregate shelter are moved to some sort of appropriate housing. Shelter transition is an important and vital part of concluding a mass care response and yet there is no written guidance or instructions to aid the local emergency manager in performing this task. To help fill this void the Red Cross and FEMA are creating a multiagency working group to address this issue. I will be one of the Project Leaders for this effort. I will have more to say about this project at a future date. "I hope that I don't see you this summer!"